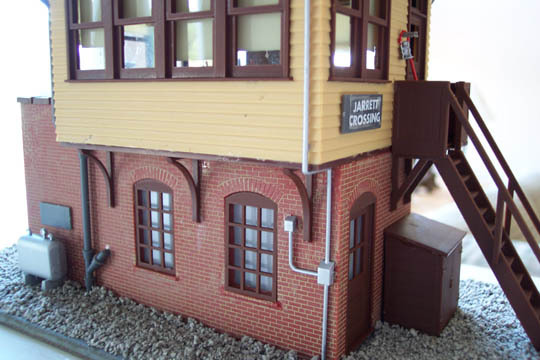 The Atlas model Switch Tower is a mainstay of many gauges. It was inevitable I'd end up making one. My parents gave me this kit for Christmas 2002 (or was it my birthday in March 2003?). The kit is very nicely done, and is pretty intuitive to put together. My father has pretty much perfected the technique of coloring the mortar in between raised bricks in cast-in templates like this, and he wasted no time demonstrating how easy this is to do. He mixed a combination of yellow and gray acrylic paints in a dish (you don't need much), and a few dabs of tap water from the ends of his fingers. He mixed these together thoroughly, and adjusted until he got a light cream color - perfect mortar. We rubbed it all over the brick surfaces, making sure to get it into the cracks between the bricks. We let it dry only for a few minutes, and then took a clean napkin and started wiping the excess from the surfaces. You can wipe pretty hard, and still not remove any of the paint from the cracks. If you over-do it, just apply some more of the paint, let it dry a few minutes, and try again. The results look great, at least to my eyes. We did not paint the brick surfaces with any color prior to this mortar operation - the underlying cast-color of the Atlas model looked about right as-is. However, I did thoroughly dull-cote these brick surfaces before assembling. 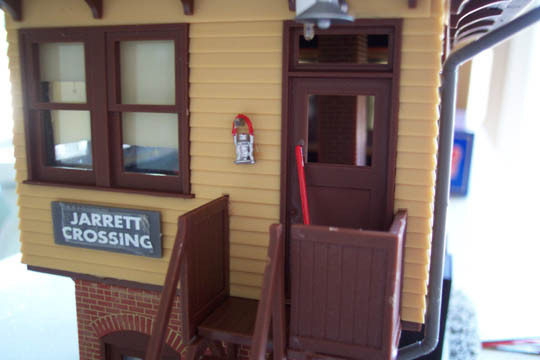 What I also should have done before assembling was flip these brick patterns over, as well as the yellow siding pieces, and paint them black on the back-sides. You see, I had always intended to illuminate this model from within, but the cast-plastic pieces are not opaque, and therefor glow somewhat when you turn the inside lights on. I ended up fixing this by tediously glueing small, custom-cut pieces of black cardboard all over the inside of both the top and bottom enclosures after assembling the building. This was murderously difficult, and could easily have been avoided if I'd only spray-painted the back-sides of all walls with opaque, black paint before assembling. The same technique that worked so well for the brick mortar also worked pretty well on the roof, which has cast-in shingles. The roof piece is a cast-gray color, and so I just used black acrylic, slightly watered down, and rubbed it into the cracks. I then let it dry a few minutes, and wiped off the excess with a dry napkin. A healthy layer of dull-cote, and voilla! - a reasonably weathered roof. Because I wanted to illuminate this model from within, the window material Atlas supplied would not suffice by itself. After installing the supplied window material, I glued pieces of a mylar material I obtained at a local craft store which is "foggy". This lets light through from the inside, but does not permit one to see inside the building at the bare light bulbs. I only applied this to the lower level, because the upper level has some nifty interior detailing, including a brick chimney and a series of multi-colored manual switches, which is the point of the whole tower. The interior chimney offered a great spot to drill a hole and mount a small light bulb (near the top, close to the underside of the roof). This illuminates the entire upper level, but you can't readily see the bulb due to the simulated blinds that are half-shut at random levels on the windows. Atlas prints these blinds on the window material for you; a great touch. I also mounted a small light bulb on the outside, right behind the supplied light fixture. I considered trying to affix the bulb to the supplied fixture, but the piece is too small and delicate for this modeler's hands to work with, so I did the next-best thing and mounted a small bulb directly behind it, to simulate that it is coming from the supplied piece. The effect is not as convincing as I'd hoped for, but it works. After getting through most of this project, I realized I would probably want a base for the building to sit on. I cut out a base from 1/4" plywood, and rounded the corners. Then I painted the edges with a slate gray color. Then I placed the completed building on the base, centered it roughtly where I would want it to sit, and traced the edge of the building onto the plywood base with a pencil. Then I removed the building and brushed on a mixture of wood glue and water (50/50), and a drop of dish detergent. When brushing this on, I took care not to brush into the interior of the building tracing I had drawn. Then I sprinkled on copious amounts of gray gravel obtained from my local hobby shop. This first layer stuck to the areas I had brushed on the glue mixture, and I needed to wipe away some of the glue and rocks from the edge of the tracing. I dumped the excess gravel into a basin by turning the whole thing upside down and tapping it gently. I let this dry for several hours, and then sprayed this first layer of gravel with an artist's spray adhesive. Then I dumped a second layer of the gravel on the first layer, and turned it upside down (over the basin) and again tapped the excess gravel off. The result satisfied me, and gives the impression of a gravel base around the building. The next step is to spray a sealant on top of the gravel to lock it into place from above. Wiring was a pain in the neck, as the building is smaller than anything I've illuminated internally before. But in the end, it looks pretty good lit up in a night scene. This kit was a lot of fun, and really didn't take all that long, if you exclude the lighting and associated wiring, and the gravel base. 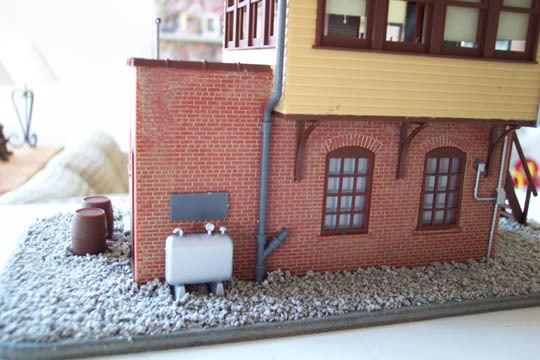 The kit by itself was done in an afternoon, including the brick and roof detailing. A lesson learned is that I should have affixed the decals onto the plastic signs before I sprayed them with dullcote. I believe the dullcote created a surface texture that makes it very difficult for the decals to adhere to. After drying, they bubbled up and in two cases fell off by themselves. A much better solution would have been to apply the decals first, and then dullcote after they had dried. All-in-all, this was a really well-thought-out kit by Atlas, and I look forward to building more from them. Great article. I have this structure and you have given me lots of detail ideas. I had one of the Atlas towers in HO when I was a kid. They sure go back a long way, but still make an excellent building especially when weathered and accessories added like you did. 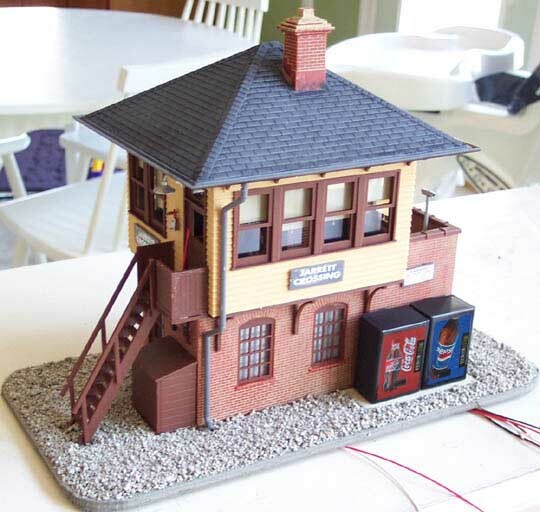 That kit always brings back memories of my first layout back in the late '60s. 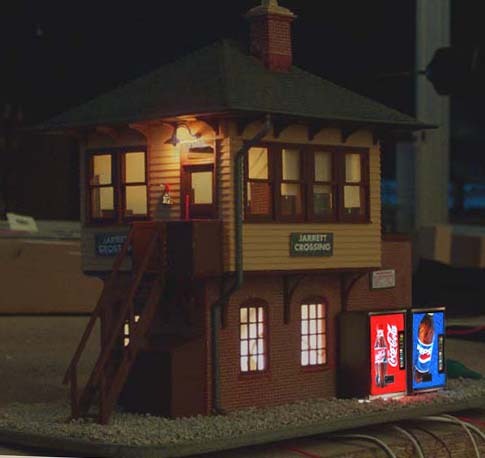 I think I am going to have to track one down in O gauge. 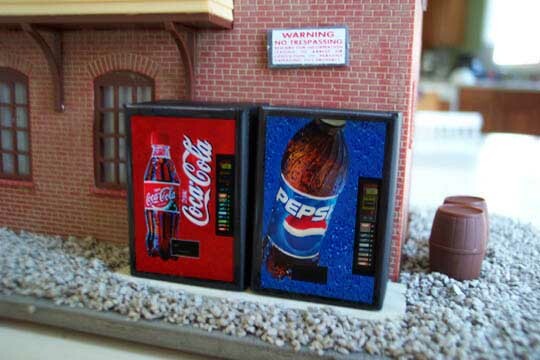 However, I will have to locate an old '50s pop cooler instead of the modern Pepsi and Coke machines you have. I used to build 1/24th cars too. I still have about a dozen of them I built when I was single living in a small apartment. I used to do the same thing with he grills. Then carried it over when building HO brick building kits. Little effort and great results!! Hello Peter, I see you are here too! 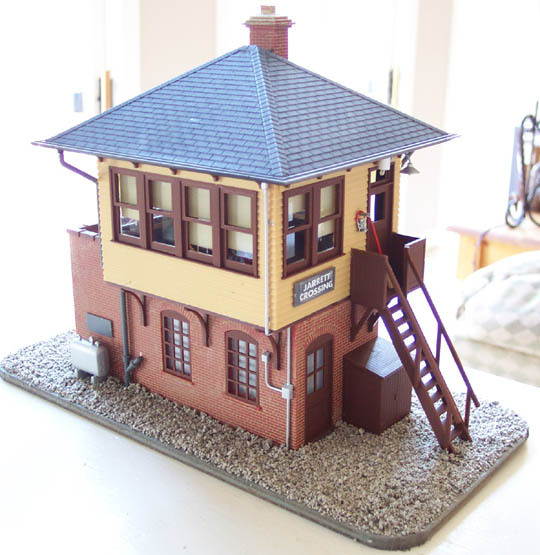 I picked this model as my first model to do for my layout. But I was wondering what did you use to illuminate the interior. Did you use material specifically made for models? Sorry for my silly questions, I'm a noob to this hobby. Hi Darth - nothing special or fancy, just 2 or 3 small incandescent bulbs that run on about 18 volts. They are the same little bulbs I used for the little vending machine kits I used to do. I'd give you the URL of where I ordered them from, but it's been so long ago that I don't remember. If I were doing this the first time now, I'd use LEDs. You can get strands of "warm white" LED Christmas lights, probably on good sales now that the holidays are over. You can pull each LED out and string 3 - 4 of them in series, probably run them right off your 12 volt accessory power. Or use them individually with the proper resister and they will a) never burn out, b) produce almost zero heat and c) use a lot less electricity. Let us know how it goes - looking forward to your progress.